Its government legalized medical marijuana at the end of December, and the American territory had only just gotten its sea legs in the competitive industry when Hurricane Maria crippled what could have been a potential economic savior for an island $74 billion in debt. “Big manufacturing and grow facilities have had their roof blown off, there is water in their manufacturing rooms, equipment damaged, no light for plants and most are dead," said Goodwin Aldarondo, the president and CEO of Puerto Rico Legal Marijuana. “You’re talking about millions of dollars of damage and we just started as an industry,” he added. Hurricane Maria swept across the island on Sept. 20, causing widespread damage and flooding. At least 44 people died either directly or indirectly from the storm, officials said. High winds and a deluge of rain crippled key infrastructure, destroyed homes and devastated businesses across the island. The Puerto Rico Medical Cannabis Association is currently assessing the cost of the damage for the industry’s insurers — a particularly integral calculation as the medical marijuana community does not qualify for federal aid because of legal restrictions. And its importance is particularly stark, as medical marijuana grew to be a symbol of the potential for economic prosperity for cash-strapped Puerto Rico. But the island’s medical marijuana companies are starting to make a comeback; 20 of 29 medical marijuana dispensaries have reopened, according to the association. In the first two weeks after the storm, only four dispensaries could fill prescriptions. Prior to the storm, patients with a medical marijuana cards could only pick up their prescriptions from the single dispensaries that they were assigned to, but that rule has undergone a temporary change. In an Oct. 6 determination, the Puerto Rican Department of Cannabis' board approved allowing patients to go to any open clinic, regardless of the dispensary they had been assigned. The new rule lasts until two weeks after the state of emergency has ended or until the board decides to terminate it. Medical marijuana is legally used in Puerto Rico to address more than a dozen conditions, including Alzheimer's, cancer, Lou Gehrig's disease, Parkinson's, rheumatoid arthritis, Crohn's disease, epilepsy and more. The Puerto Rico Medical Cannabis Association plans to host a fundraiser on Monday that would provide a voucher to fill a patient's one-month prescription if she or he is struggling to make ends meet after the storm. Yet the industry, still in its infancy, will still have to overcome some formidable challenges. Namely, keeping shops, grow centers and manufacturing sites operational when only 17 percent of the island has electricity and many islanders are still struggling to find clean drinking water — let alone enough water to irrigate thousands of plants. According to the Department of Defense, 36 percent of the island still don't have access to water. The cannabis association says 90 percent of grow houses in Puerto Rico are indoors, and the plants require constant artificial light and watering. The dispensaries and manufacturing sites that are operational have become dependent on generators, and so they require a huge amount of diesel to stay afloat — which they say triples their monthly electricity bill. Nevertheless, industry leaders on the island agree that acquiring diesel has become less of an issue in the past week, but clean water, particularly enough to irrigate plants, is still a huge issue. 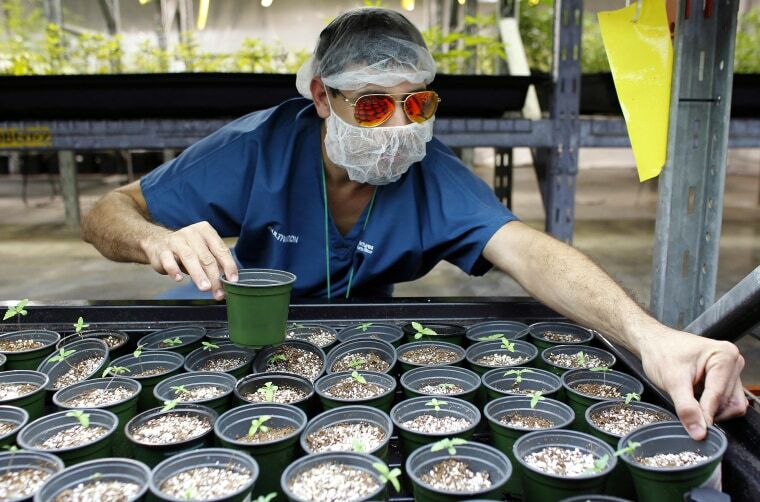 And those in the industry are careful to make sure that they follow all the rules and deliver a quality product, as they worry this could be a sink-or-swim moment in Puerto Rico's medical marijuana history.